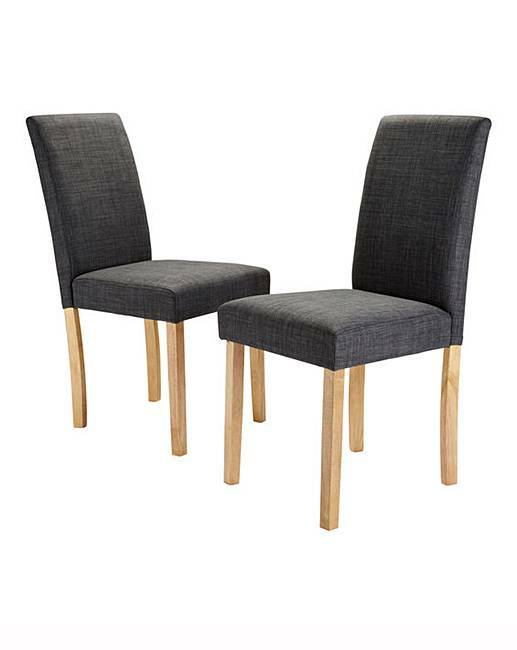 Mia Fabric Pair of Dining Chairs is rated 4.8 out of 5 by 10. A classic dining room chair, upholstered in a beautiful linen look fabric. Available in a choice of leg colour to complement our great range of dining tables. Co-ordinates perfectly with one of our dining tables - Oakham oak veneer dining table range, Oakham glass panel oak veneer dining table range or Albany dining table range. Rated 5 out of 5 by Bomberbee from Ria Fabric dining chairs I purchased 4 pairs of these chairs. Good value and quality. Delivery was swift. Even though they made a mistake with the colour of 1 pair of legs it was quickly rectified. Rated 5 out of 5 by DailyGlobe91 from Comfortable & elegant I have just refurbished my wine bar with these chairs & they have given it a new look throughout. Rated 5 out of 5 by Clairabel from Stylish chairs Really pleased with these chairs - good quality, comfortable, easy to put together, modern and stylish - just the job to go with my oak table. Rated 5 out of 5 by Crocks from Comfortable I bought these to.replave my old dining chairs for Xmas. The look good and are very comfortable. Rated 5 out of 5 by Susieque from Very comfortable and stylish Looks good, very stylish and extremely comfortable. It goes well with the table we chose. Very reasonable price.